Dr Moffet suggests the missile pods be placed under the fuselage near the centre for stability when firing, he also insists they need to be adapted so they could be deployed and retracted as and when needed. 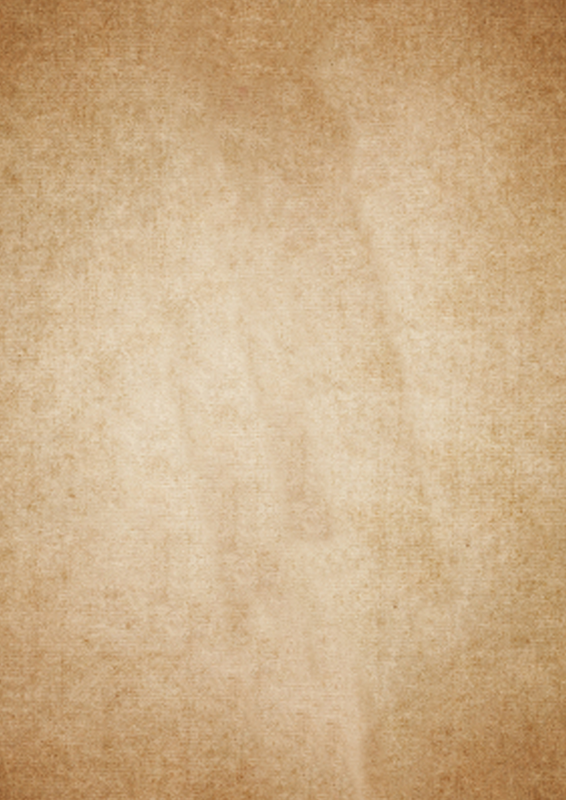 A napkin slipped within a file stated (SHE MUST BE A SHEEP IN THE EYES OF THE WORLD!!!) I concur with the team’s current findings due to the stability issues. I also advise that funding for concealed armament would remove later costs and requirements for an additional rolling ground unit. Professor Probert has been in contact to confirm the aerodynamic panels have passed all wind tunnel testing along with standard durability tests against low calibre projectiles. Patterson Enterprises security clearance has been approved, in turn they are now contracted to make the necessary modifications to the airframe and attach the new panels along with the prototype nose cone. A supersonic test flight is scheduled for the 14th of March, if the panel fitting is completed on time. Dr Robert Winchester has asked again about joining the test pilot program, as per your instruction I have informed him that, for the moment he is needed on the ground and in the lab working on the E.D.C.C. Harlan Jenkins and Charles St. Clair are still undergoing security checks before they can be approved for the backup test pilot and co-pilot positions. Dr Moffet has yet to request authorization to fly the aircraft and has spent the majority of his lab time working upon the firmware and the attack computers stack analysis feature. Dr Karen Hansen failed to pass security checks for eyes on access due to her connection with A.P.E.X. 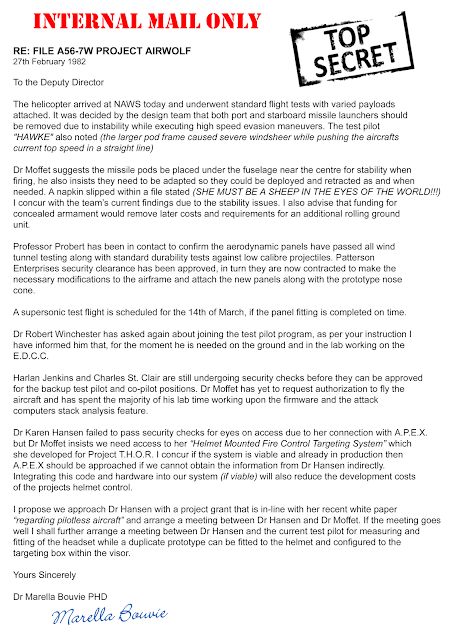 but Dr Moffet insists we need access to her “Helmet Mounted Fire Control Targeting System” which she developed for Project T.H.O.R. I concur if the system is viable and already in production then A.P.E.X should be approached if we cannot obtain the information from Dr Hansen indirectly. Integrating this code and hardware into our system (if viable) will also reduce the development costs of the projects helmet control. I propose we approach Dr Hansen with a project grant that is in-line with her recent white paper “regarding pilotless aircraft” and arrange a meeting between Dr Hansen and Dr Moffet. If the meeting goes well i shall further arrange a meeting between Dr Hansen and the current test pilot for measuring and fitting of the headset while a duplicate prototype can be fitted to the helmet and configured to the targeting box within the visor. I live in the UK, my computer is EN-GB not EN-US, Airwolf is an american show, as such i tried to keep this internal memo as american as i could. Such as using the USA word "maneuvers" instead of UK word "manoeuvres" and USA word "Authorized" instead of UK word "Authorised"
consider that before nitpicking typos. 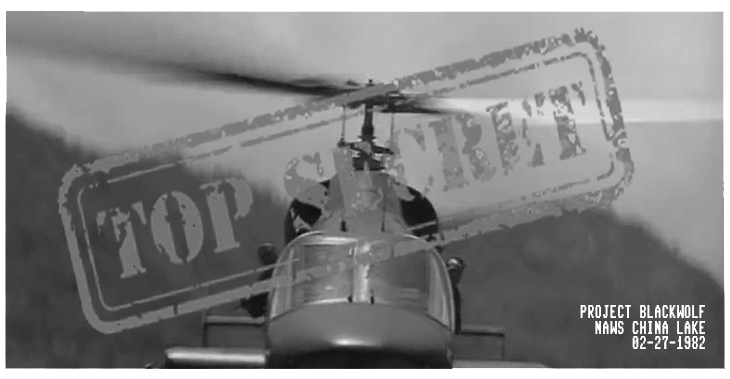 If you haven't seen the airwolf season 2 episode "moffetts ghost" or the 1983 film "blue thunder" then the elaboration on Airwolf's Dr Karen Hansen wont work for you, it WILL WORK for everyone who has seen that episode and that film. Also in the Movie/Pilot its spelt Moffet, in the season 2 episode its spelt Moffett. 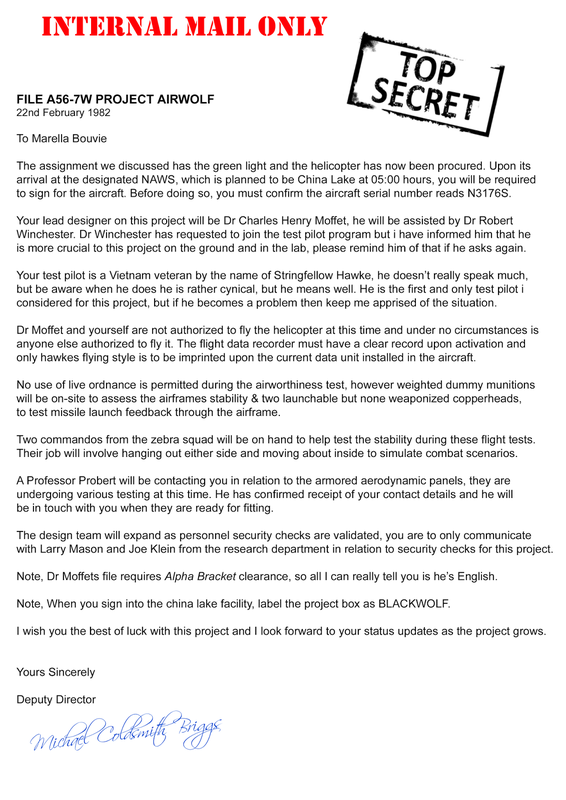 The assignment we discussed has the green light and the helicopter has now been procured. Upon its arrival at the designated NAWS, which is planned to be China Lake at 05:00 hours, you will be required to sign for the aircraft. Before doing so, you must confirm the aircraft serial number reads N3176S. 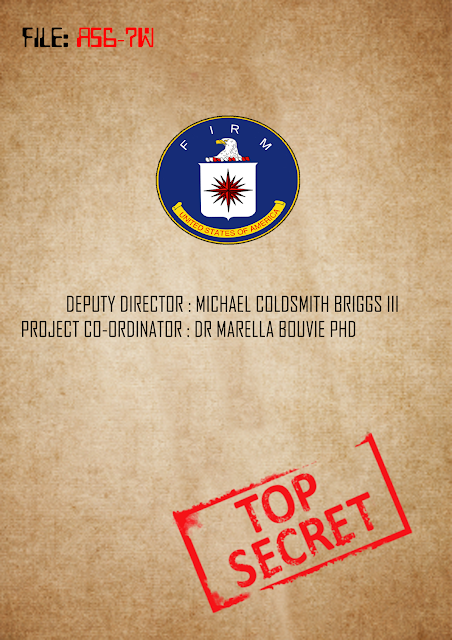 Your lead designer on this project will be Dr Charles Henry Moffet, he will be assisted by Dr Robert Winchester. 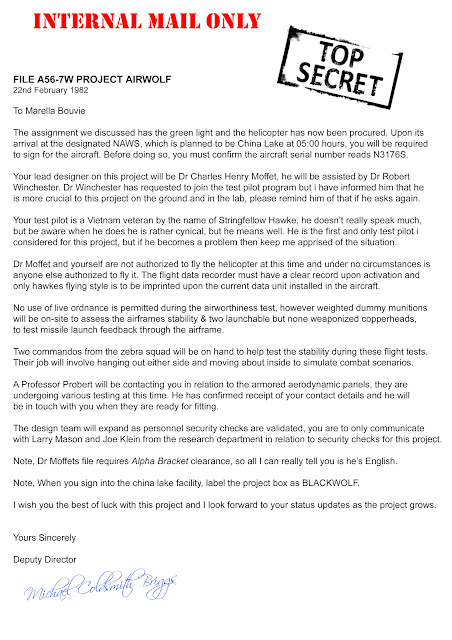 Dr Winchester has requested to join the test pilot program but i have informed him that he is more crucial to this project on the ground and in the lab, please remind him of that if he asks again. Your test pilot is a Vietnam veteran by the name of Stringfellow Hawke, he doesn’t really speak much, but be aware when he does he is rather cynical, but he means well. He is the first and only test pilot i considered for this project, but if he becomes a problem then keep me apprised of the situation. Dr Moffet and yourself are not authorized to fly the helicopter at this time and under no circumstances is anyone else authorized to fly it. The flight data recorder must have a clear record upon activation and only hawkes flying style is to be imprinted upon the current data unit installed in the aircraft. No use of live ordnance is permitted during the airworthiness test, however weighted dummy munitions will be on-site to assess the airframes stability & two launchable but none weaponized copperheads, to test missile launch feedback through the airframe. Two commandos from the zebra squad will be on hand to help test the stability during these flight tests. Their job will involve hanging out either side and moving about inside to simulate combat scenarios. A Professor Probert will be contacting you in relation to the armored aerodynamic panels, they are undergoing various testing at this time. He has confirmed receipt of your contact details and he will be in touch with you when they are ready for fitting. The design team will expand as personnel security checks are validated, you are to only communicate with Larry Mason and Joe Klein from the research department in relation to security checks for this project. Note, Dr Moffets file requires Alpha Bracket clearance, so all i can really tell you is he’s English. Note, When you sign into the china lake facility, label the project box as BLACKWOLF. I wish you the best of luck with this project and i look forward to your status updates as the project grows.